Sometimes a piece of jewelry does not need precious gems or metals to render it meaningful and special. In the early nineteenth-century, Prussians wore jewelry made of cast- iron, ironically, with great pride. 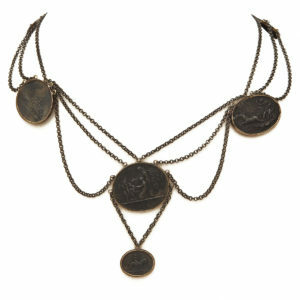 At the time of the Napoleonic Wars (1803-1815), Prussian citizens showed their support for the war effort by exchanging their gold and silver jewelry for pieces of iron adornment; hence this type of jewelry came to be called Berlin iron. The jewelry’s intrinsic value was inconsequential. Iron, a strong and native material coming from the Prussian Royal Foundries, imbued the pieces with patriotic fervor. Berlin iron jewelry usually featured inscriptions touting support for the war effort, most commonly ‘Gold gab ich für Eisen’ (I gave gold for iron) or ‘Für das Wohl des Vaterlands’ (for the welfare of our homeland). Neo-classical motifs, such as cameos and acanthus leaves, dominated early Berlin iron pieces. 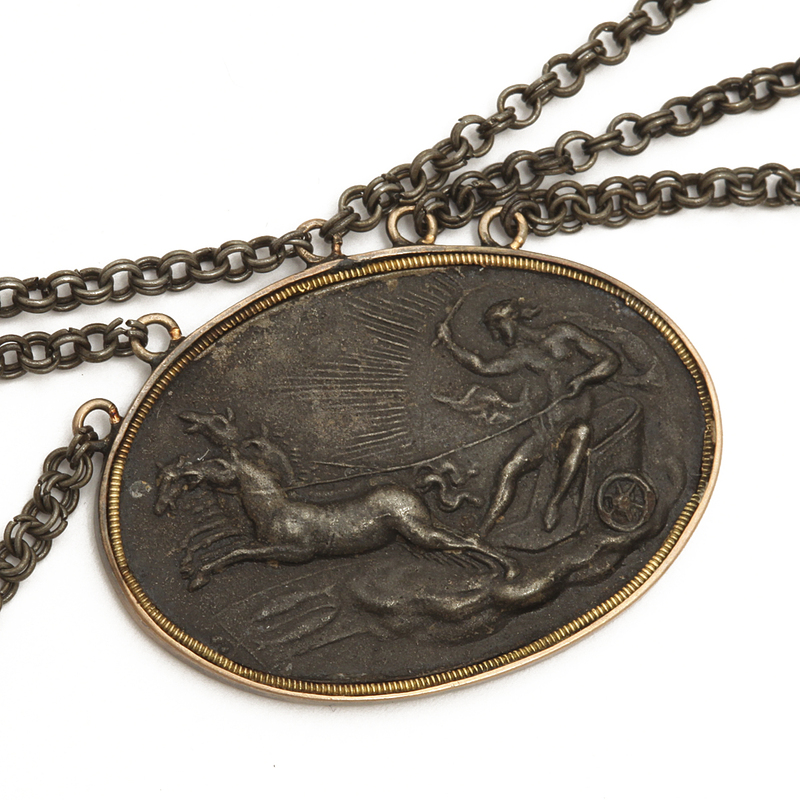 The necklace in our collection features medallions with neo-classical scenes and dates to around 1806. Portraits and mythological scenes used in Josiah Wedgewood’s jasperware and James Tassie’s glass pastes were incorporated into designs. By 1815, Gothic and nature-inspired motifs replaced or embellished neo-classical designs. Susceptible to rusting, they were sealed with a lacquer made of flaxseed, causing a black coating, another distinctive feature. Berlin iron jewelry remained fashionable up to the middle of the nineteenth-century. Though initially a style wrought by nationalism, it eventually cast wider appeal, reaching consumers across Europe and in America.